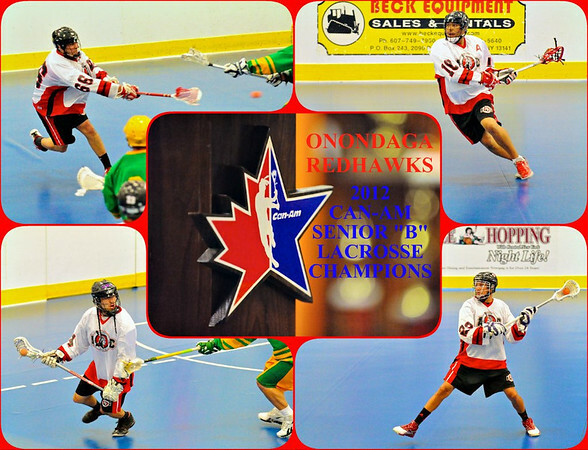 2012 Can-Am Senior “B” Lacrosse Champions Onondaga Redhawks. 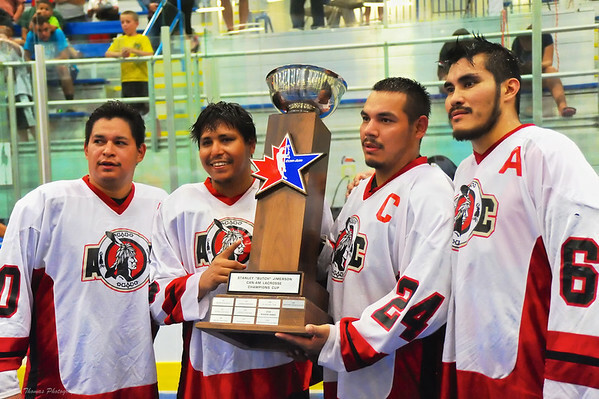 Players from top left: Brett Bucktooth (66), Neal Powless (16), Dwayne Porter (23) and Tyler Hill (14). The Onondaga Redhawks won the Stanley “Butch” Jimerson Can-Am Lacrosse Champions Cup by defeating the Newtown Golden Eagles in the league finals Best-of-Seven series, 4 games to none, last week. The Redhawks dominated the series after taking the opening game in overtime, 15-14, in Newtown’s home arena. The clinching game was no different. After Newtown tied the game at one, the Redhawks scored 6 unanswered goals and never looked back. The final score was 17 to 5 and the celebration commenced! 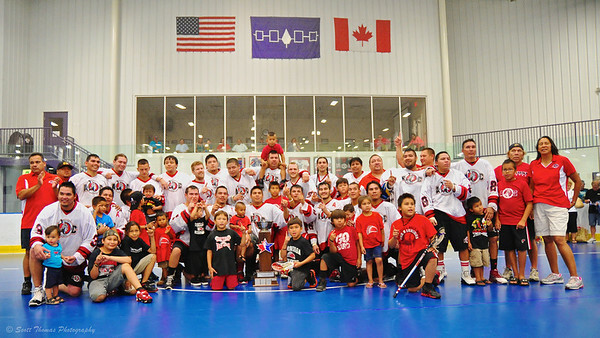 Onondaga Redhawks captains Dustin Hill (20), Neal Powless (16), David Stout (24) and Brett Bucktooth (66) with the Stanley “Butch” Jimerson Can-Am Lacrosse Champions Cup after defeating the Newtown Golden Eagles in the Can-Am Senior “B” Box Lacrosse finals at the Onondaga Nation Arena near Nedrow, New York. Nikon D700/28-85G, 1/250s, f/4, ISO 11,400, EV +1, 48mm focal length. The game of Lacrosse is a way of life for these athletes, their families and the Haudenosaunee nations of the Mohawk, Cayuga, Onondaga, Oneida, Seneca and Tuscarora. So, it was no surprise to me when it came time for a team picture with the Can-Am Cup the players wanted to include their sons and daughters in the photo. Onondaga Redhawks posing with the Stanley “Butch” Jimerson Can-Am Lacrosse Champions Cup after defeating the Newtown Golden Eagles 4 games to 0 in the Can-Am Senior “B” Box Lacrosse finals at the Onondaga Nation Arena near Nedrow, New York. Nikon D700/24-85G, 1/100s, f/3.5, ISO 4500, EV +0.3, 24mm focal length. After the group photo, each player had a chance to have their photo taken with the Stanley “Butch” Jimerson Can-Am Lacrosse Champions Cup. 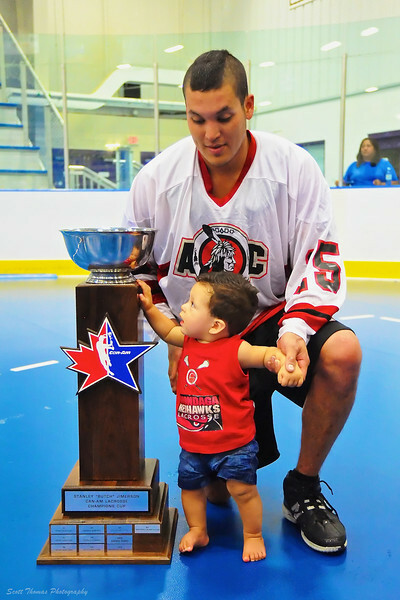 With fathers first gift to their sons being wooden lacrosse sticks in their newborn’s crib, Grant Bucktooth wanted his son to get a feel for the champions trophy. Onondaga Redhawks Grant Bucktooth (15) and son with the Stanley “Butch” Jimerson Can-Am Lacrosse Champions Cup at the Onondaga Nation Arena near Nedrow, New York. Nikon D700/24-85G, 1/200s, f/4.5, ISO 2800, EV +0.6, 45mm focal length. Click the link if you would like to see more photos of the Stanley “Butch” Jimerson Can-Am Lacrosse Champions Cup presentation and post-game celebrations. It has been a pleasure and an honor to photograph the Onondaga Redhawks this season. The Redhawks next stop is Alberta, Canada next week in their quest for another President’s Cup. You can follow the Redhawks at the 2012 Presidents Cup by clicking here. This entry was posted in Sports and tagged 70-200mm, box lacrosse, can-am, celebration, championship, charity, cup, native americans, nedrow, new york, nikon D700, onondaga, onondaga nation arena, presentation, redhawks, team, vr. Bookmark the permalink. Given its popularity in Canada, you would think that hockey was our official national sport — it isn’t — lacrosse is. Sadly, I’ve never watched a lacrosse game in my life. Bet they were exciting for you to watch. Great photographs, as usual, Scott. I was surprised to learn that about Canada, too. Makes sense as the game of lacrosse was played in Canada long before ice hockey was invented. In a way, hockey is the winter version of box lacrosse or visa versa. The skills needed to photograph both sports is very similar. And both Lacrosse and Hockey have Stanley Cups, too! Who knew? (Well, OK, you did.) I just love these photos, Scott. You did a really good job of capturing the meaning as well as the action.